Welcome to our weekly #BookishBloggersUnite post! #BookishBloggersUnite is a meme that started when a bunch of book living bloggers decided it would be fun to get together each week and talk about some of our favourite bookish things. Everyone is welcome to join in, and we take turns hosting – Bron super excited to be this week’s host! I’m running a bit late on this week’s prompt (sorry) but I’m going to try to avoid naming most of the authors I noted in last week’s Book Bloggers Unite post. Celeste Ng blew into my life with Everything I Never Told You and came back to break me with Little Fires Everywhere. She’s only got the two novels, but I’ll read anything she decides to put out in the future. She’s also a great Twitter follow with her #smallacts tag and ideas. A funny story – when Celeste came to town on tour for the paperback release of EINTY, we conversed briefly on Twitter about how I was coming to the reading. (Yay!) However, because I use a picture of my cat Chaucer as a Twitter avatar Celeste didn’t know what I looked like…and asked several people ahead of me in the signing line if they were balletbookworm on Twitter. LOL. Someday I’ll get a stick mask with my avatar on it and carry it around at book events. Lauren Groff is an author I would love to read more from. I was part of an early reader group for The Monsters of Templeton way back when. I just couldn’t get into that book for whatever reason (I think because I didn’t quite like the main character, but it’s been a minute). So I didn’t read any more of her books until Fates and Furies was due to publish and I downloaded the galley on a whim to read on a trip – without knowing anything about it – and it totally blew my socks off. Right after, Arcadia popped up as a Nook deal so I bought that and read it. Also an excellent read. Clearly, I have missed something with Lauren Groff so I need to pick up more of her work. Ok, so don’t throw things at me but….. I really should. I know I really should. I own Kindred, the Xenogenesis/Lillith’s Brood trilogy, and Seven Stories’ Press’s new editions of Parable of the Sower and Parable of the Talents. So I have no excuse except lack of time and zero brains to remember. And that’s it for this week (until Friday, haha)! #BookishBloggersUnite is a weekly hashtag that a group of bookish friends participate in to talk about books. Posts will go up on Friday (or whichever time works best for our time zone!). This first post is about introducing who we all are. Katy is hosting our first week. My parents. It’s all their fault, hahahaha. Not only did they read to me, a lot, as a small child they modeled reading and we had tons of books in the house on all sorts of subjects. I was also encouraged to entertain myself with a book or to bring a book and “read” to my mom while she was busy with my baby brother long before I could read on my own. So books have always been part of my life. Well…I definitely lean more “literary” in my fiction as well as classic literature but I also really enjoy breaking up my serious reading with romance and comics. Religion, politics, business, and Westerns. One great standalone I can read over and over again. This island has sticks and sand, right? If I get bored I’ll just write my own. Mostly by imprint/publisher, because I love how the colophons line up on the shelf, and then sort of by subject. So all my Penguin Black Spines are together, my Deluxe Classics are together, my Vintage International are together, BN Classics, Best American, etc. Unless it’s a Penguin Drop Caps or New York Review of Books edition, those are by Roy G. Biv, and I keep most of my signed books together in one bookshelf. Lots of signings. I think my favorites were Jasper Fforde, Celeste Ng, and Alexander Chee (three times, once at BRL and two with amazing interviews conducted by Garth Greenwell). And a signing for my friend Valerie, because having an actual award-winning poet friend is pretty awesome (shameless plug for Valerie’s poetry because it is really, really good, go read some). I read across all formats. I do default to paper formats if it’s a book that I’m going to have a conversation with and scribble all over (like the new translation of The Odyssey from Emily Wilson). 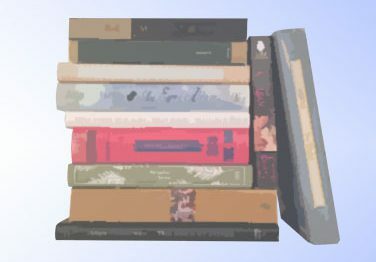 I will say that I loathe mass markets and avoid them if at all possible – the consequence is that almost all my romance and other genre reading, if no other paper format is available that I might like, is done as ebooks. Light nonfiction is often done as audiobooks borrowed from the library Overdrive site. A lot of times I read the digital galley ahead of publication because #booksellerlyfe. What is your favorite book to recommend that isn’t a common recommendation to new readers? What We See When We Read by Daniel Mendelsund – an interesting meditation from a graphic designer on how our brains fill in detail while we read. What does the ideal reading day for you look like? It has to really make me feel like I’m wasting my reading time (like Tom Hanks’s book – y’all, I have some screen shots of some really eye-wateringly bad writing), since I’m usually pretty good at avoiding crap books in the first place. Otherwise, if I start a book, and it’s not really doing it for me, I’ll put it in “hibernation” – and then years later I’ll finally decide to DNF it. The Female Persuasion by Meg Wolitzer, The Recovering by Leslie Jamison, Celestial Bodies by Laura Jacobs, and Too Wilde to Wed by Eloisa James. Which series/book to you revisit for self care/nostalgia? Winnie-the-Pooh is my “can’t function, can only lay in a ball” self-care read. I also revisit Jane Austen’s novels, Little Women, and the Thursday Next series (especially on audio). Do you have a bookish pet? This is my Chaucer-kitteh. Named not quite for the actual author of The Canterbury Tales, but mostly because I read a romance novel in high school (The Wedding by Elizabeth Bevarly) in which a secondary character, who was a professor of Middle English, had a horrible, nasty, beastly tabby cat named Chaucer. I wasn’t sure about the adjectives, but I thought a tabby cat named Chaucer would be lovely. Years later, I acquired one. Until last Saturday, I had a Dante-kitteh, too. We miss him a lot. Do you enjoy readathons? If so, which ones can people find you participating in? An excuse to read as much I as I want all weekend? Yes, please! I usually participate in Dewey’s 24-hour Readathon and the 24-in-48 Readathon. What is one part of bookish life you enjoy that isn’t reading? Is there a genre you wished you read more of? Philosophy. I really wish my eyeballs wouldn’t run screaming from my head when I tried to read the actual text instead of a precis/summary. This is hard, because there are SO MANY absolutely beautiful book covers roaming around on my shelves. I will say that Penguin’s graphic design department is hitting it out of the park with the Deluxe Classics, Black Spines, Drop Caps, and Clothbound series. I think the Henry Holt anniversary re-jacketing of the Lloyd Alexander Prydain Chronicles series is one of my favorite redesigns (The Book of Three). And that’s it! Visit Katy’s site or follow the tags to see who else is participating. Bonus picture of the Chaucer-kitteh, because I found it while deciding which picture to use above and I couldn’t resist. He is sound asleep here.